Posted in Domain Tools, Features & Tips. Bookmark the permalink. Above.com’s Domain Summary Page, found in the “My Domains” section of Portfolio Manager, provides in-depth domain level reporting right at your fingertips! Almost anything you could want to know about your domain name can be found within this one page. Find highly detailed information about individual domains in your portfolio without having to calculate spreadsheets, consolidate stats, or put pie graphs together. Even quickly edit fields such as entering a for sale price, activating brokerage, or entering custom data points. This page is unique because Above is able to consolidate stats from all your monetization channels and pull registrar data. It’s also free to use for every single domain in your portfolio! Snapshot of total/unique traffic visits. The first row of charts available are perfect for setting a for sale price based on traffic and revenue earned. Users could also choose to provide interested buyers with a trustworthy snapshot of what the domain has earned in the last year. 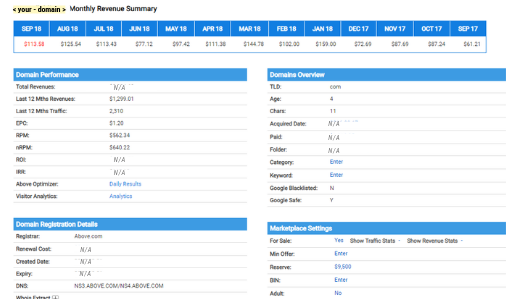 In addition to the charts at the top of the page, there is an annual revenue summary broken down by month as well as information on domain performance, domain registration details, marketplace settings, and a general domain overview. If you have questions about this page or about domain portfolio management in general, talk to one of our specialists at contact@above.com or message us on Live Chat!